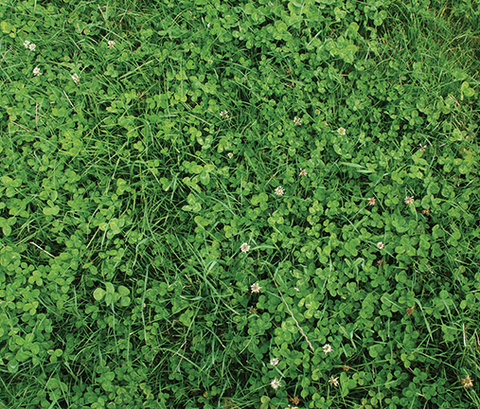 Increasing the white clover content of an existing grassland sward by overseeding can be a quick and cost effective way to boost pasture dry matter yield and quality, according to Helen Mathieu of forage specialist Germinal. Including white clover in mixtures at the time of a full reseed would still be the most effective way of establishment, but overseeding is a valuable way to introduce or restore levels part way through the lifetime of a ley. The optimum balance of white clover to ryegrass in a mixed sward is an average over a growing season of 30% white clover of the total dry matter production, but estimating this is notoriously difficult. Where the balance is right, this has been shown to increase milk yield from grazing by as much as 30%, when compared with grassonly swards. In addition to saving bought-in feed costs, white clover at this optimum level will contribute up to 250kgN per ha, reducing the requirement for bought-in fertiliser. There are also proven benefits from white clover in terms of soil structure, which then boosts overall grassland productivity. As with any seed establishment, the key is to create the right conditions for germination. In the case of overseeding, the most important thing is to reduce the competition from the companion species. There needs to be adequate space within the existing sward for the new seedlings to establish. “Overseeding can be carried out any time between spring and the end of August, but the optimum time is usually when grass growth slows slightly in what should be the drier summer months of June and July,” says Ms Mathieu. 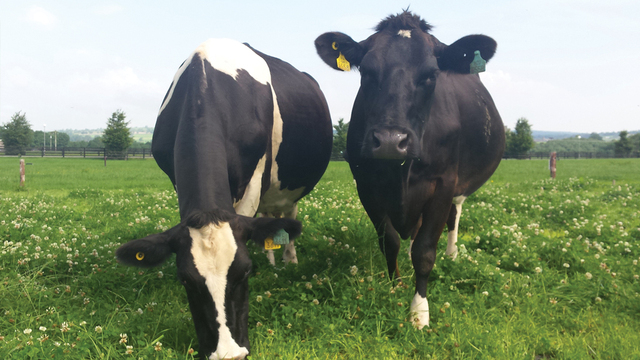 Milk production from grazing has been shown to be up to 30% higher from a grass and clover sward when compared with grass-only pasture. 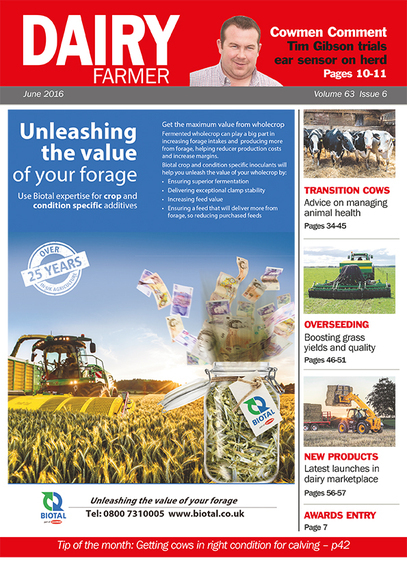 “Ideally you want minimal competition from the grass, and lower soil nitrogen levels – so directly after cutting for silage is often the best time for overseeding. 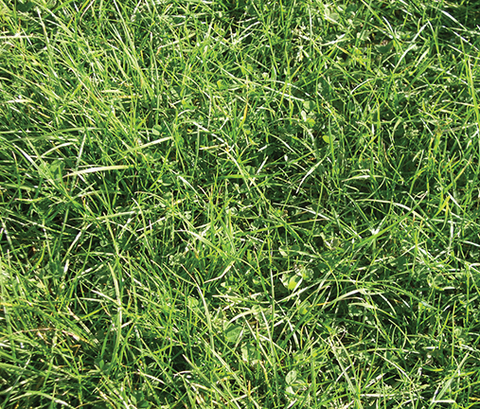 Alternatively, ensure the sward has been grazed hard before overseeding. Once the sward is depleted – through cutting and grazing – then it is important to create some soil disturbance to ensure as much of the seed as possible has soil-to-seed contact and is covered to an optimum depth of 5-10mm. “There are specialist tine drills and direct seeders available now that are designed for overseeding and will generally achieve the best results if other conditions are right,” she adds. “It can also be effective to create soil disturbance by chain harrowing and then broadcasting the seed, and then following this with a further harrow and/or rolling. The important thing is to create soil-to-seed contact and achieve the optimum sowing depth. 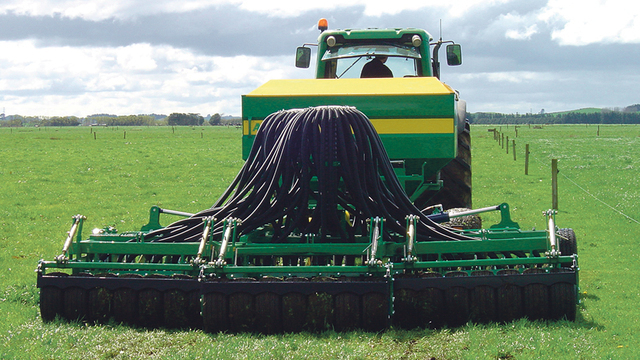 The practice of overseeding white clover, and managing white clover in a sward, has been made easier with the development of nitrogen-tolerant varieties. Overseeding into an established grass sward with specialist machine. Work done with Aber white clovers at Ibers Aberystwyth University has shown it is possible to maintain optimum white clover content under relatively high nitrogen input regimes with these varieties (280-320kg N/ha), which means grassland can be managed for high output performance whilst also reaping the benefits of white clover inclusion. Sward renovation through overseeding will typically cost about one-third of that of a full reseed and, while the results will be only a proportion of that achieved by a full reseed, there is the advantage of there being no significant shortfall in production in the interim. “There will be some temporary reduction in output during the process, but the clover will be established in four to six weeks and should contribute for the duration of the ley. “Management after overseeding involves inspecting the sward at least twice a week. You do not want the grass to out-compete the new clover seedlings. “If the grass is growing too vigorously, you will need to graze carefully with cattle or sheep for just a day or two, to quickly bring the grass under control. “But avoid grazing overaggressively as this will risk damaging the young clover seedlings,” she added. 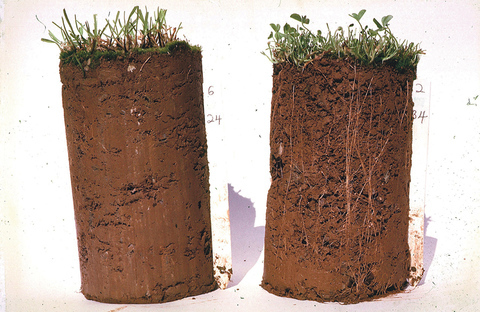 Soil profiles without and with white clover, showing the benefits that rooting provides to soil structure. A sward with the optimum of 30% white clover content. A sward with only 10% white clover, lower than the optimum.